What a nice year was the 2018! With the ups and down. With a lot of new things I learnt, new friends, new places. The year passed so fast, especially these last 3 months, that I started my EVS here in Romania. It's almost the 1/3 part of the time I will spent here, doing my EVS and I feel I learnt and done so many things that I couldn't even imagine in my pre-EVS life. And all of these thanks to Mihaela, the project coordinator, Dragoş, my mentor and Alin, my Romanian Language Teacher. Starting with this month, December, we made with some others volunteers of our organisation Asirys, a plan for presentation in Petru Rareş technological school, in Tîrgu Frumos. We visited the school and we talked with almost 200 students and their teachers about our NGO, about non-formal methods of education and about volunteering.We created a program that is called "Fapte Bune" (Good acts) in which the students are invited do some good things for their school, colleagues, teachers, town. They had so many ideas and they did a lot of things during this program. We introduced Forum Theatre and we made a discussion about the problems they deal everyday, like bullying. Due the high interest, we created a Forum Theatre team who presented the play during the Balul Bobocilor event , in the front of more than 300 students. The Forum play approached the issue of dropping out the school and on the first hand, had a bad end. The other students had to replace the characters to solve the problem. It was a very useful experience for the students and for me because I learnt with the help of my coordinator more about the non-formal educational methods and about technics that for sure I will use on the future. 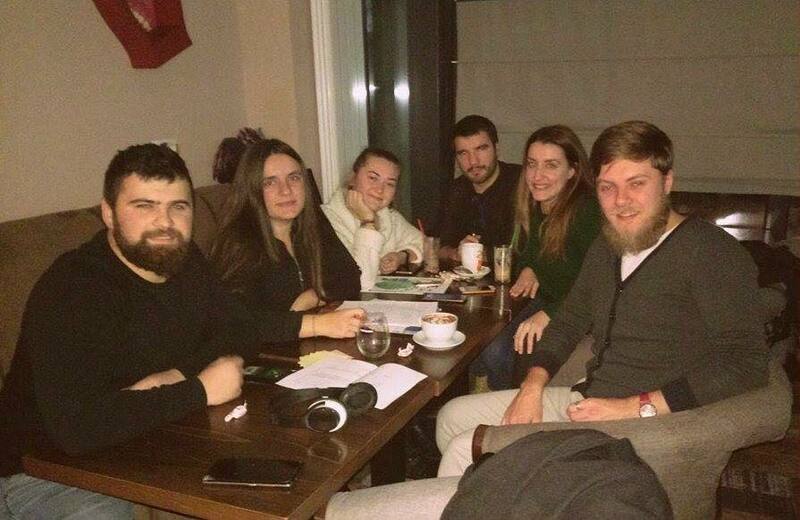 Continuing with the month, I had a monthly meeting with my mentor, Dragos, in which we discussed about my EVS journey so far and he gave me very good ideas on how to put in order the things I am learning for using them when I will finish my EVS and I will create my NGO. Also I organised a workshop in our Youth Center with the topic "Tea & Crafting". It was a crafting workshop and we created some bookmarks and we discussed about other handcrafting things we would like to create. Another very useful experience I had this month was the cooperation of our NGO with the Code school in Iasi, a local business in which children learn more about computer programming languages. We made a workshop using non-formal educational methods presenting to the students the theory of the Multiple Intelligences by Howard Gardner. It was a very interested workshop for the students as we understood from their big smiles, and also for me because I haven't done something similar with this topic. I also gain a lot of knowledge during the preparation of the workshop by reading books and by discussing with my EVS coordinator, Mihaela. An unforgettable experience this month was the visit we had on Deleni, where we saw a Folk event with traditional dances, songs and clothes. I also listened some traditional Romanian Christmas songs. I met a lot of new people and we discussed about possible cooperations with our organisation. 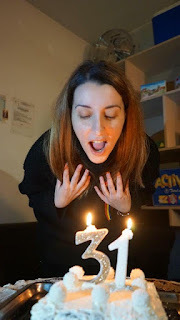 This month was my birthday. In the morning we had a Newspaper workshop in our Youth Center from our volunteer Ioana and after, we did my birthday party. A lot of volunteers came, we danced, we ate, we played board games like my favorite, Dixit. I felt like it was one of my favorite birthday parties in my life and I want to thank to the volunteers so much for that. And then the Christmas came. We made a group with others volunteers and we visited local houses and we sang Christmas Carols in Romanian. It was very challenging and fun at the same time for me, because I didn't understand the language but the volunteers helped me a lot. I visited a town near Tirgu Frumos, Piatra Neamt. I saw the beautiful view of the town from a "telegondola" and visited the Natural and the Historical Museum. 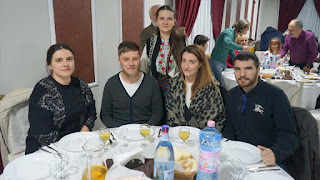 In the New Year's Eve we were invited in the house of Alexandra, who has a local organisation in Iasi, called Youth Alma. 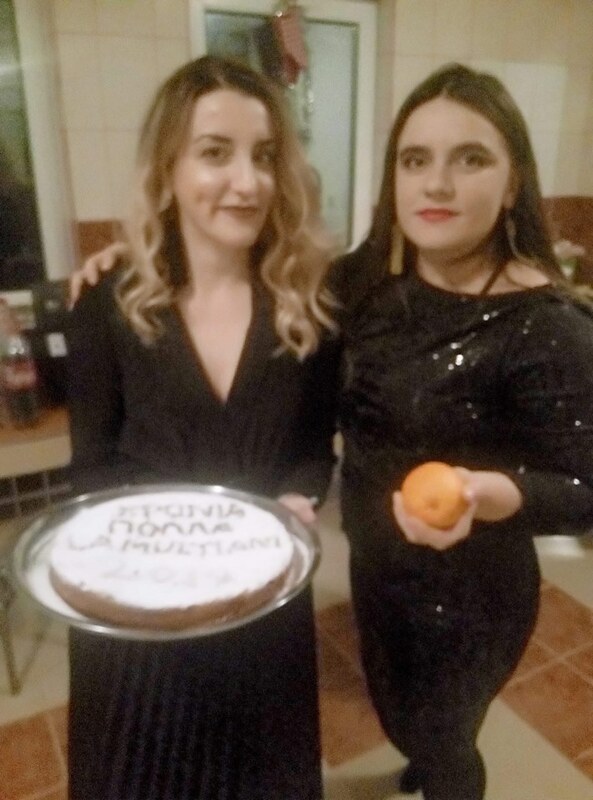 We made with Mihaela some traditional sweets and a greek cake called "vasilopita" which we cut in Alexandra's house. It was the end of the year I wanted. I was smiling and enjoying the company of people I have close in my life and on my EVS. 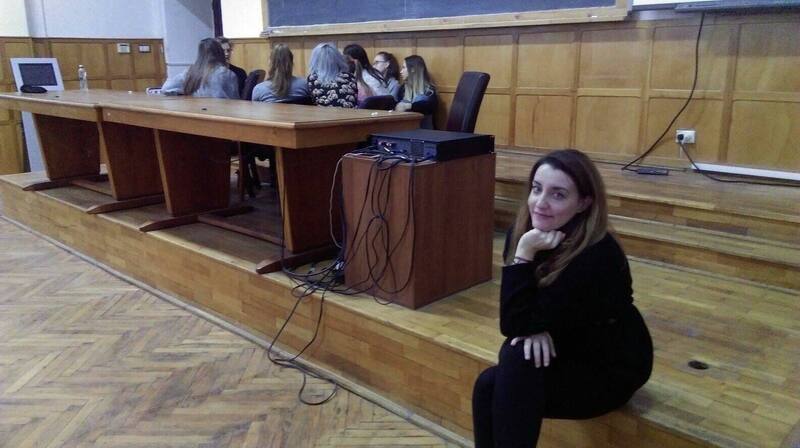 As you may know, we are hosting at the moment our first EVS volunteer, Nikolia, from Greece. She will spend 12 months with us, helping to develop our youth center and create a more active community by volunteering! Each month our volunteer, Nikolia Papadopoulou will share her experience in Romania through a small report. Building Bridges is a project funded by Erasmus+, a programme of the European Union. The content of this article is the exclusive responsibility of the authors, and the National Agency and the European Union are not responsible for how the content of the information will be used.